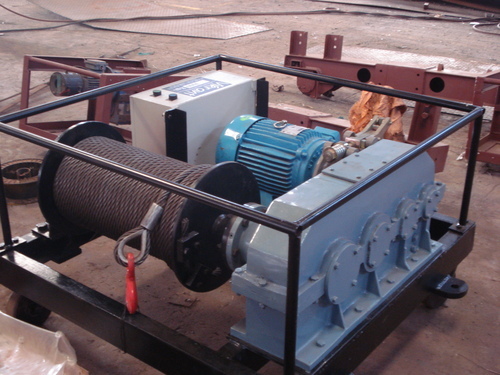 A winch is a mechanical device generally used to adjust the tension of a wire rope. These vary widely in their form ranging from only consisting of a spool and an attached hand crank in simplest forms to being much more advanced containing gear assemblies, powered hydraulically or electrically that stand at the core of many modern machines such as tow trucks, elevators etc. Owing to their optimal functionality in adjusting wire rope tension, it's safe to assume that winches are used in some form across all major industries. Historical anecdotes dating back to around 5th century B.C of the usage of winches have been found. These were generally made of wood and used to erect pontoon bridges and also in ships to pull in or let out wind through the sails. Since the aforementioned date, winches have continued to evolve. Today winch manufacturers make these out of various materials and with various working methods. Winch suppliers today, offer varied types of winches including snubbing, wake skate, glider and air winches. These are widely used in different machines across all major sectors and in all geographies from land, water to air.